Sheilacakes: Incredibundles Review and Ultimate Diaper Bag Giveaway! Incredibundles Review and Ultimate Diaper Bag Giveaway! One of the exciting things about becoming a mother is your first Mother’s Day. It is a very special day to celebrate with your baby. My first Mother’s Day was kind of crazy. My mom had been in Florida and was supposed to get home at like noon so we could celebrate together. Her flight was delayed and she missed her connecting flight. She didn’t end up getting home until about 8 pm. We were both really upset, but Noah and I had a great day together. We ended up celebrating the following day. It was a wonderful Mother’s Day, a day late. My first Mother’s Day gift was the first season of NCIS. I love that show, it’s one of my favorites. Some families celebrate Mother’s Day when the mom to be is pregnant. It’s a good way to sneak in some extra baby gifts. Having a baby is expensive so any gifts are always appreciated. I learned about a website called IncrediBundles that sells adorable baby gifts. I love the premade bundles or you can create your own. They even have diaper subscriptions. I wish I would have had that when Noah was a baby. The great thing about that is you can pick the length of the subscription from 3 months, 6 months 9 months, and 12 months. You don’t have to worry about the size either. The parent can select the size the baby needs. That is great because Noah was a big baby and grew out of sizes very quickly. There are also toys and books and blankets. I love that they have unique items too. The year of toys is great too. Everything has the age range, which is important when you are not sure what to purchase. One of my friend’s that I have known since elementary school, just had his first baby. It’s really weird because I have known him for so long. I am so happy for him and his wife. Their son is so adorable. I had already purchased a few gifts when I met him for the first time but I couldn’t resist getting him some extra stuff from IncrediBundles. I know so many people who either just had a baby or are expecting. It can be daunting what to buy, especially if you don’t have kids. Last time I bought him some toys so this time I wanted to do something different. I got him my favorite baby item. I had planned to get it for him when she was expecting but never did. I got him a Sleep Sheep on the Go. That is my go to baby gift. It is an amazing cuddly sheep that has a sound machine inside it. I originally learned about it when I was pregnant with Noah. We actually drove from Indiana to Virginia Beach to buy one at an upscale maternity store. We were going on vacation anyway but I was able to find out that they had a store in Virginia Beach. Noah loved the Sleep Sheep on the Go and he would always turn it to the whale noises. My mom and I thought it was funny, and looking back now, it makes sense because he loves sea life. 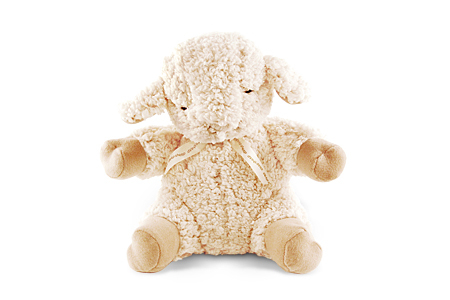 The Sleep Sheep on the Go helps calm your baby and puts them to sleep. I remember listening to it and falling asleep too. Anytime I buy a baby gift, it’s a Sleep Sheep on the Go. I got one for my niece when she was born too. It also lasts a really long time. Noah has had his for nine years and it still works great. It’s also very affordable it’s only $19.50 which is cheaper than I have ever seen it. I wanted to get my friends’ son some books because I love to read to babies. I think that is when the foundation of loving to read begins. Spending a few minutes reading a simple book with bright colors can help your child’s brain grow. I got him On the Farm which I love because it’s a touch and feel book. You can take your baby’s hand and let them touch the soft chicks and feel the pig and the cow. 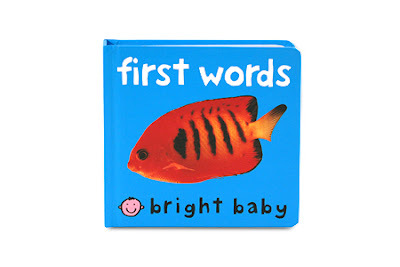 I also got him Bright Baby First Words. I love the series of books and I think Noah has owned them all at one point. The pictures are big and bright and it helps them associate the word with the item. The books are short enough that they hold your baby’s attention. I also got him the Fluffy Chick which is also another touch and feel book. Those were always my favorite as a kid and Noah’s too. Noah is convinced that babies eat books. That’s because when he was little he used to chew on his books. Noah helped me pick out the gifts because he is really close with my friend and I picked out the other gifts we purchased for him. Noah insisted we get him a toy. Noah is all about toys. So we got him the Kringelring. 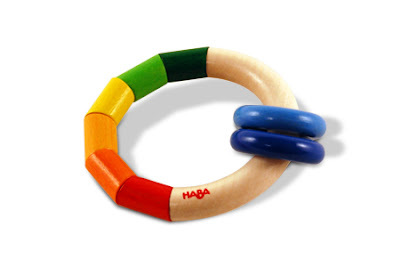 It’s a rattle and a teething ring. He won’t need the teether for a while but it is totally safe for him to put in his mouth. I love that it’s made out of wood and is all non-toxic. If you aren’t sure what to get them, you could purchase a gift card. If you want to go in on a big gift with your co-workers or friends, each purchasing a gift card to IncrediBundles can help go toward a diaper subscription. Sometimes, it’s hard to find the diapers in the brand and size that you want. 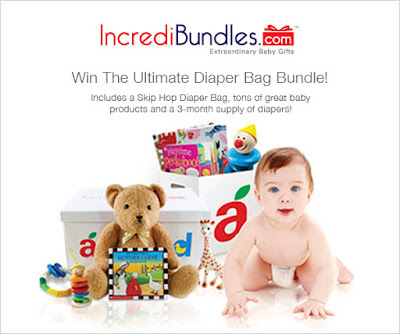 IncrediBundles sells Pampers, Huggies and Luvs in their diaper subscription and you don’t have to do any of the work. Click and go. 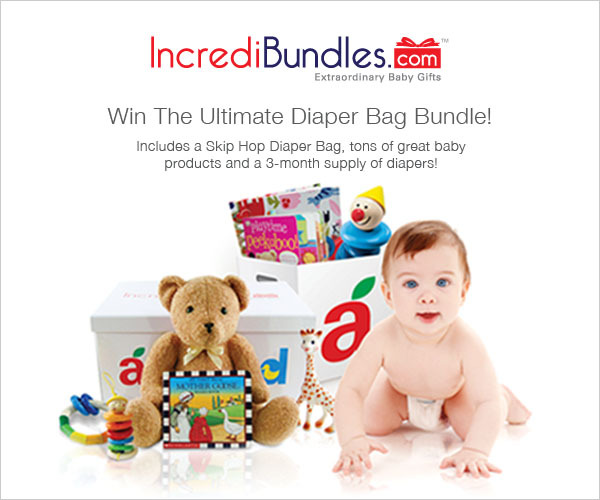 IncrediBundles can be your own personal Diaper Fairy. For more information and to order an adorable bundle of baby gifts please visit IncrediBundles. Share a picture of what you love to bring on the go with your little one on Instagram and use the hashtags #momonthegocontest and #incredibundles. Incredibundles will pick one winner on Mother’s Day to win the Ultimate Diaper Bag which will include a premium brand diaper bag stuffed with lots of goodies Mom and Baby will both love – including a 3 month supply of diapers! Contest closes on May 7th.